"Celebrate 53 Years of The Best Music with Eastern Music Festival! Join EMF and Music Director, Gerard Schwarz for five weeks filled with more than 100 music-related events. Enjoy great music every night of the week during June 23 – July 26, 2014! Approximately 200 young artists and 80 faculty musicians return to Eastern Music Festival (EMF) to study, enjoy and share classical music with the community. Exceptional guest artists joining EMF this season include cellist Lynn Harrell, flutist Sir James Galway, violinists Elmar Oliveira and James Ehnes, as well as pianist Jon Kimura Parker. Other season highlights will include the Fifth Annual Piano Competition and performance at the Kennedy Center for Performing Arts, the EMFkids camps Family Concert, a collaboration with Greensboro Ballet performing George Balanchine’s® Serenade set to Tchaikovsky’s Serenade for Strings, op.48, the inaugural EMF Fun Run to raise money for a 2015 student scholarship, and this year we are featuring guest artist CD sales and signings; also Gerard Schwarz will be signing DVDs of the Emmy Award winning All-Star Orchestra! 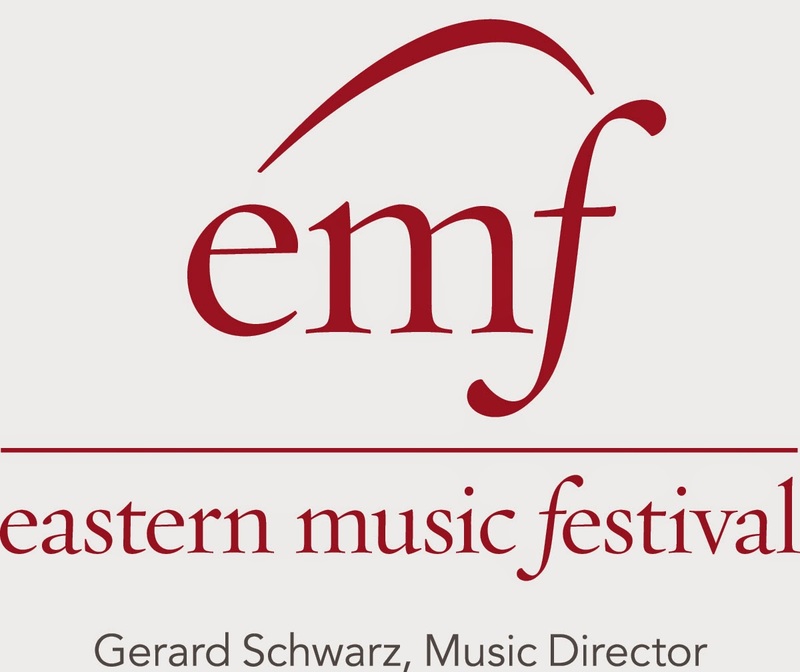 To purchase tickets to any EMF event, visit our website at www.EasternMusicFestival.org or contact the Eastern Music Festival Box Office at Triad Stage by calling 866.579.TIXX or 336.274.0160. The Eastern Music Festival Board has honored one of its longtime stellar members by naming its signature Saturday evening series for Joseph M. Bryan, Jr. The popular Saturday evening series, sponsored by Lincoln Financial, opens on June 28th with guest artist Lynn Harrell, cello. Sir James Galway, flutist (July 5) and Elmar Oliveira, violinist (July 21), Jon Kimura Parker, pianist (July 19), and James Ehnes, violinist (July 26). Repertoire highlights include Bloch: Schelomo; Hebraic Rhapsody; the World Premiere of Corigliano: Lullaby performed by Jeffrey Multer, violin (made possible through ten years of commissions provided by Bonnie McElveen Hunter); and Dvořák Symphony No. 8. All Festival Orchestra Series performances are on Saturday evenings at 8:00 pm, in Dana Auditorium, on the campus of Guilford College. Be sure to come early for our Concert Preludes on the Dana Lawn at 7:15 pm each week! For guest artists’ biographies, as well as more information concerning each evening’s performances, please visit our website at www.EasternMusicFestival.org. The Monday evening UNCG Chamber Series presents thoughtfully selected repertoire performed by our talented professional musicians and faculty members. Join us each week when the EMF faculty performs chamber selections alongside our outstanding guest artists including Lynn Harrell, cello, William Wolfram, piano, Elmar Oliveira, violin, Robert Vernon, viola, Jon Kimura Parker, piano, and Keith Spencer, baritone. Elmar Oliveira will be signing CDs following the Monday Night Chamber Series performance on July 14. Concert dates are June 23, June 30, July 7, July 14, and July 21 at 8pm in the UNCG School of Music Recital Hall. For even more chamber music, join EMF each Tuesday at Christ United Methodist Church (410 North Holden Road) at 8pm for our EMF Chamber Series at Christ United Methodist Church. Concert dates are June 24, July1, July 8, July 15, and July 22. Our talented faculty members perform “the music of friends” in this intimate setting. From pianos and organs to concertos and operas, the Friends & Great Performers Series showcases a range of diverse events in distinctive settings. Kicking off the series is the annual EMF Piano Gala on June 25, at 8:00 pm at Dana Auditorium, Guilford College featuring pianists, Gideon Rubin and William Wolfram. Join us July 2, at 7pm at Carolina Theatre for a collaboration between EMF and Greensboro Ballet presenting George Balanchine’s® Serenade set to Tchaikovsky’s Serenade for Strings, op.48. “Sing To Love”, an EMF and Greensboro Opera collaboration on July 9, 8pm and The Music of Antonio Vivaldi featuring EMF musicians on July 16, 8pm, at Temple Emanuel (1129 Jefferson Road). Rounding out the Friends & Great Performers series on July 23 is The Organ and Choral Music of Fauré & Langlais featuring Gerard Schwarz, conductor, Carole Ott, guest conductor, Kathryn Mueller, soprano, Keith Spencer, baritone, and Andre Lash, organ, 8pm, at Christ United Methodist Church. The Tannenbaum-Sternberger Young Artists Orchestras are comprised of EMF’s outstanding pre-professional musicians. These gifted students, aged 14-22, come from around the world to study and perform in Greensboro. Each week, you will hear them rise to the challenge of an increasingly demanding repertoire. During the final week of the festival, young artists are the featured soloists in our Concerto Competition Winners concerts. All concerts are held every Thursday and Friday at 8:00 pm in Dana Auditorium at Guilford College. José-Luis Novo and Grant Cooper, associate conductors, lead the students through their musical journey and performances; in additionally, they will perform under the baton of Maestro Gerard Schwarz. Repertoire highlights for the Young Artists Series include Strauss: Stravinsky: Le Sacre du printemps (The Rite of Spring); Cooper: Appalachian Autumn; Beethoven: Symphony No. 2 in D major. Performing alongside our Young Artists are notable Guest Artists Neal Cary, cello (July 4) Jeffrey Multer, violin (July 11); and William Wolfram, pianist, (July 18). For a complete listing of Young Artists Orchestra Series dates and repertoire, visit our website at www.EasternMusicFestival.org. On Sunday July 13, come dressed as your favorite character from Star Wars and run or walk to raise money for a 2015 EMF student scholarship in the inaugural EMF Fun Run & 5K, 9am on the campus of Guilford College! Register now at www.EasternMusicFestival.org and receive a free t-shirt at packet pick-up! The Young Artists Orchestra Pops Concert will also be held on Sunday, July 13, at 6:30pm, on Founders Lawn at Guilford College featuring GUEST CONDUCTOR, in conjunction with the Music for a Sunday Evening in the Park. EMFkids camps presents the 2014 Family Concert on Saturday, July 19, 1:30pm at Dana Auditorium on the campus of Guilford College. Featuring Associate Conductor Grant Cooper’s, On the Appalachian Trail, and Strauss: Till Eulenspiegel’s Merry Pranks. EMF Family Pack: $5 /Adults (up to 2 adults), $1 / Children (up to 4 children). Pre-activities, food and fun, for families begin at 1pm. Opening the 2014 EMF Fringe Series in collaboration with Music for a Sunday Evening in the Park will be Diali Cissokho & Kaira Ba Sunday July 20, 6:30pm, on the Lawn at Dana Auditorium on the campus of Guilford College, admission is free. Eastern Music Festival Piano Sale will be held July 25-27 on the campus of Guilford College. Seiler pianos used by EMF guest artists are available for sale at a fraction of their true value. For best selection, please schedule a preview appointment today: (800) 203-4548. Guest artists Master Classes will be held throughout the season. For more information and a complete listing of Bonus Concerts, visit our website at www.EasternMusicFestival.org. For the most up-to-date Festival information, be sure to follow us on Facebook (Eastern Music Festival) and Twitter (EMFGreensboro). To purchase tickets to any EMF event, visit our website at www.EasternMusicFestival.org or contact the Eastern Music Festival Box Office at Triad Stage (232 South Elm Street) by calling 866.579.TIXX or 336.274.0160. Season and single tickets are currently on sale. Triad Stage service fees will apply to all ticket purchases made via phone or online. For a list of detailed prices and more information on tickets, including discounted and group specials, visit www.EasternMusicFestival.org. The Eastern Music Festival’s mission is to promote musical enrichment, excellence, professional collaboration, innovation and diversity through a nationally-recognized teaching program, music festival, concerts and other programs which will enhance the quality of life, health and vitality of our region. Eastern Music Festival is distinctive, set apart by our accomplished faculty, exhilarating repertoire, brilliant students, world-renowned visiting artists and extensive community outreach. The Eastern Music Festival and School, founded in 1961 in Greensboro, North Carolina, by Sheldon Morgenstern, is an internationally-renowned classical music festival and institute for young musicians that runs for five weeks each summer. The institute accepts students ages 14 through 22 from around the country and the world. The EMF faculty consists of world-class performing artists selected from top orchestras and music schools nationally and internationally. Led by music director Gerard Schwarz, the Eastern Music Festival and School celebrates its 53rd season in 2014. The 2014 Eastern Music Festival season is made possible with support of the Lincoln Financial Foundation and the following sponsors: Lincoln Financial Advisors, Top Jewish Foundation, Audio & Light, The Carl & Toby Sloane Family Foundation, Bluezoom, Christ United Methodist Church, DMJ, Whole Foods of Greensboro, Arts Greensboro, Guilford College, High Point University, Green Valley Grill, Greensboro Ballet, The Mebane Foundation, McMillion Capital Management, The Music Academy of North Carolina, NC Arts Council, Pennybyrn Maryfield, Piedmont Music Center, Seiler Piano, Print Works Bistro, O Henry Hotel, Wyndham Championship, Carolina Theatre, Zildjian, Tannenbaum-Sternberger Foundation, Summit Rotary, Temple Emanuel, News & Record, 88.5 WFDD, Hugh Hodgson School of Music, UNCG School of Music, Theatre and Dance, BB&T, Well Spring, Greensboro Rotary Club, Rice Collision Center, and GoTriad. Proximity and O.Henry hotels are the Official Hotels of the Eastern Music Festival. Major financial support for Eastern Music Festival provided by the United Arts Council of Greater Greensboro. For the most up-to-date Festival information, be sure to follow us on Facebook (EasternMusicFestival) and Twitter (EMFGreensboro)."